Is it weird to talk about this? Or is it weird not to? Needless to say, we’ve all found the need to pee outside our homes at some point. Which is to say, we’ve all said our prayers to the Public Porcelain Gods and taken the plunge. But not all restrooms are made alike -- not even close. So we’ve rounded up all of our favorite WC's in Boston and broken them down by neighborhood. Behold, the most wicked pissah pissers. Whatever genius decided to put a Notorious B.I.G. 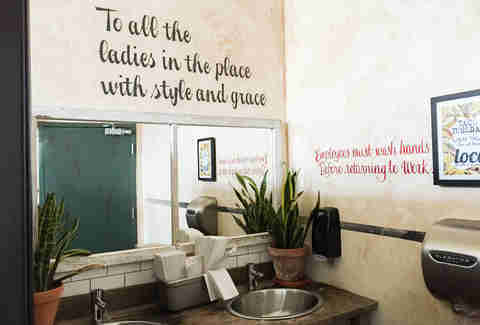 quote in these bathrooms ("To all the ladies in the place with style and grace"), we applaud you. Although something from "Ten Crack Commandments" might have worked better. Because the restaurant is inside Harvard Square’s landmark Charles Hotel, the bathroom has upped its game with spa-like amenities. Two words: cloth towels. You’ll always have us at cloth towels. Runner-up: Harvard Coop, if only for the nostalgia of using the most sought-after public bathroom in Harvard Square. Bathroom reading is crucial, and Salty Pig has all others beat. 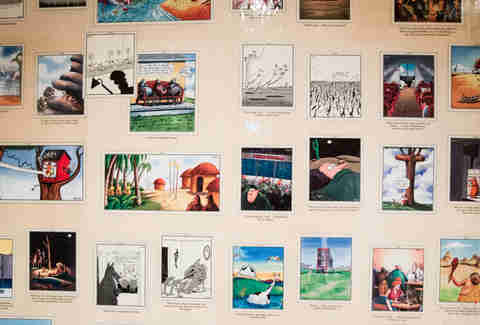 Far Side comics wallpaper the entire space, so you’ll be tempted to extend your stay luxuriating among the pigs, dogs, and cows who argue with the scientists and cowboys. Beware of Doug, and don’t read so long your feet fall asleep. This place has a couple things going for it: 1) it's literally inside the bowels of Fenway Park just beyond the outfield, and 2) the view from the men’s room is incredible (but unnerving). Forget reading the sports page; you can actually look out over center field while you do your thing. It gives new meaning to the term "dribbler up the middle." This is a tough one. The area is replete with gems (I mean, the Saks' bathroom has a freakin’ lounge chair). 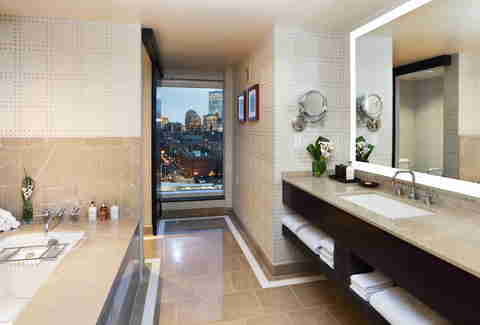 But the Taj bathroom, inside the city’s original Ritz-Carlton, is just old-timey glorious. 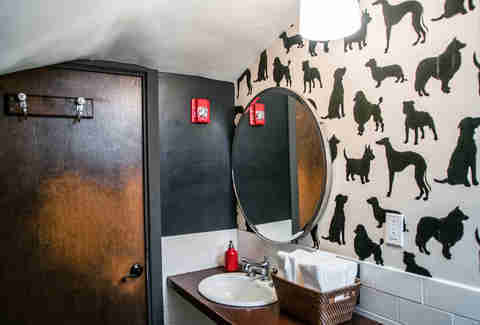 This isn’t a bathroom; it’s a bona-fide powder room, harkening back to a day when going to the restroom was a more genteel affair. It’s about the journey, not the destination. Specifically, the graffitied wall directions that point you upstairs, along with many variations on the word "bathroom": potty, baños, toilet, and loo, to name but four. And once you get there, the destination has more terrific reading material (translation: anti-alcoholism ads in Russian). Did we mention the view of the Boston Harbor? It may rival the scatalogical Soviet propaganda. 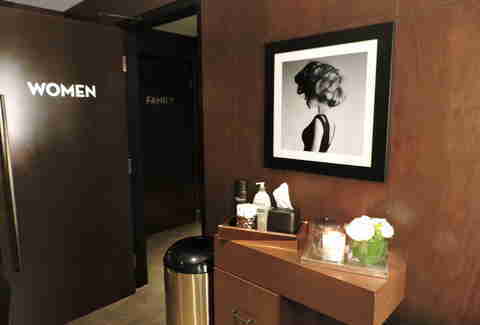 We can’t speak to the opulence of the men’s bathroom, but OP’s ladies WC is the lavatory of our dreams: complimentary perfumes, hair elastics, and, yes, feminine products, along with soy candles and an overall sanguine air. This is nicer than your entire first apartment after college. And unremarkably, it also smells better. A danger of the single stall is having to wait while people wash hands, groom themselves, and take endless selfies in the mirror. Puritan has a fine solution: a nearby communal hallway sink, which features water-filtering rocks that also look pretty glorious. Runner-up: Dare we say the line at Starbucks, where diehard Squarers protested the area’s Starbucksification? No? OK, Loyal Nine then. 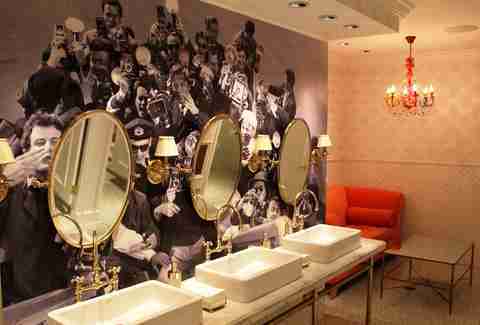 If you need design inspiration for your next lavatory overhaul, this is a good place to start. Black subway tiles laid out on a criss cross-style, gothic wallpaper, and plush paper towels displayed in a silver tray remind you that a one-holer needn’t be such a bare-boneser. We’ve never been to the slammer, but we’ve watched Shawshank Redemption enough times to know prison bathrooms are dire affairs. But not so when jail has evolved into a fabulous hotel and restaurant. 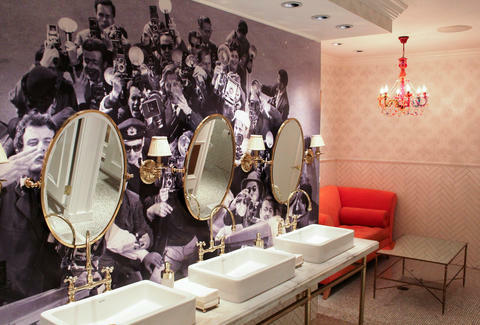 Liberty’s crapper is modern and gigantic, plus it’s tricked out head-to-pedi in the same Molton Brown as its rooms. You’ll want to spend 30 to life here. Meaghan Agnew plans to visit every Boston bathroom before she dies. Look for her bathroom photos on Twitter and Instagram (@meaghandeth).